User friendly desktop and local intranet web based as well as Cloud based web interface for monitoring, configuring and managing systems in the network with detailed report and graphical dashboard. Accessible from anywhere. Local and Cloud Server architecture to manage distributed network effectively. Prevents from all types of malware including Virus, Adware, Ransomware, Trojan, Bloatware etc. A robust multi-layer scanning engine with accurate, very good detection rate. A robust scanner Includes Next gen, multi-layer, fastest scanner with Artificial intelligence technology with supervised learning and Threat community for zero day detection and continuous improvement in the threat detection rate. Also included behavioral and heuristic scanners along with traditional signature approach and comes with complimentary 24x7 technical support, whenever you need it. IDS/IPS Detects malicious network activities which exploit application vulnerabilities and blocks intruder attempts. Firewall Monitors inbound and outbound network traffic based on rules. File Activity monitor monitors which files were copied, deleted, renamed. Parental Control blocks malicious sites. Also lets you schedule when PC or Internet can be available for certain user. Web Filtering Blocks sites as per its categories. So you can block Social sites etc. 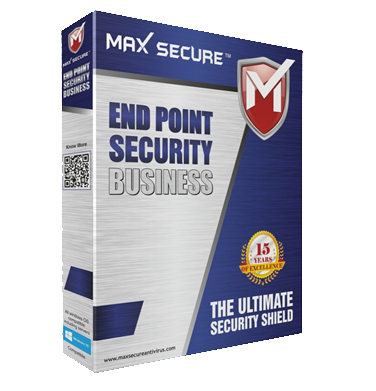 What is Max Secure End Point Security-Business? Max Secure End Point Security-Business leverages client-server architecture to detect and delete threats across a network while putting control in the hands of IT administrators, not end-users. With virus and spyware threats, intruders are able to gather confidential company information and intellectual property without consent. Threats kills productivity by delivering ads that distract and frustrate employees by taking time away from projects resulting in missed deadlines. IT Staff must devote precious time and resources to combat common annoyances like popups and computer crashes and other time draining support requests. Some threats continuously broadcasts information over Enterprise networks, sapping valuable bandwidth that could otherwise be used for faster communications. If companies are not aware that threats are responsible for wasting bandwidth and killing productivity they may incur unnecessary expenses to purchase additional bandwidth and equipment. CD/DVD drive (for installation from CD). Microsoft Internet Explorer 8.0 or later and should be online(for updates over the Internet).